ProFind provides fast and complete searches of any disk, beneath an elegant and extremely powerful interface. Most file search apps search either the macOS's metadata database or the disk directly. This means they can often provide search results that are incomplete, contain unwanted items or they perform unnecessarily slowly. Not with ProFind, which searches metadata and the disk. And with support for innovative natural language queries, application launching, spatial disk browsing, hidden location searches, Finder integration, search saving, history, scripting and more, it's the only search app you'll ever need. Type a few characters from an application's name to find it fast. Configurable favorite folders gives fast access to commonly used folders. QuickLook, Finder integration, sharing support and support for shell scripts and AppleScripts. A multi-line path view shows the full location of search results and differences between paths. Limit searches to individual disks or folders. Pick extra search criteria from the menu or use the intuitive natural language capabilities. Search your Mac, from your phone. 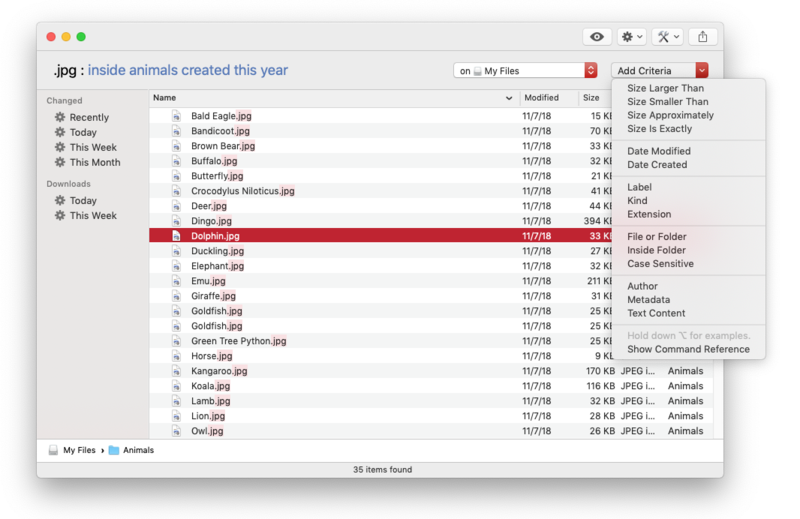 The free companion iOS app allows you to search for files on your Mac and download and share them with other iOS apps. Access the ProFile sidebar, browse favourite folders, get info and preview files. Searches and downloads are performed over an encrypted network connection. Requires ProFind for Mac. Intended for local networks only. Supports iPhone and iPad. Search inside invisible folders and packages. Searches any disk type: Mac, Windows, servers, etc. Uses kernel based searching (searchfs) when available. Supported search locations: home, mac disks, local disks, servers, individual disks, open Finder folders. Search by: name, creation date, modification date, file extensions, tags, parent folders, kind, regex, wildcards and spotlight Metadata. Hashes: md4, md5, sha1, sha224, sha256, sha384, sha512. (Show Advanced Info). Autocompletion for application names, command names and keywords. Full, non obscured, display of file paths with path diference highlighting. Large icon view for one or two search results. Spatial disk browsing (with saving of window positions, size, scroll position, etc). Support for executing shell and AppleScripts on found items. Context menus: Sharing, Services, Open, Show In Finder, Move To Trash, Get Info, Copy Path. Supports Dark Mode (10.14 Mojave). Drag and drop out of the app. Fully configurable system wide hot key.